How utterly brilliant is that?! For those of you sitting there thinking, what the hell have you won? I find myself staring back at you asking where the hell have you been? 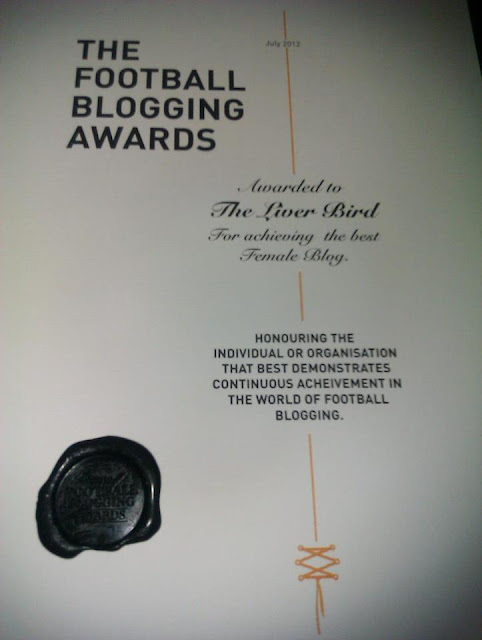 If you follow me on Twitter there is no way you will have escaped the knowledge that I was in a list of nominees for the best Female blog category in the Football Blogging Awards. Being on the short list and never one to turn down an invite to a shindig I managed to circle up two guests (a farcical amount I know) and off we headed on Saturday afternoon to Manchester. We'd booked two hotels both on the outskirts of the city, usually in these sort of posts I'd have a strategically placed jolly anecdote to do with our travels but nothing happened, not even traffic on the M6, mental. My good mate Josh drove me and the fella there and back and it's a fair drive from Wolverhampton so cheers for that!